Butternut squash is wonderful roasted, such as in the fall farro bowl I shared earlier this week. However, roasting can take awhile, especially if you have a large electric oven to preheat first. For something faster, butternut squash is also quite tasty when pan-sauteed. This pasta dish is full of many of my favorite fall flavors, especially the classic trio of butternut squash, sage and goat cheese. 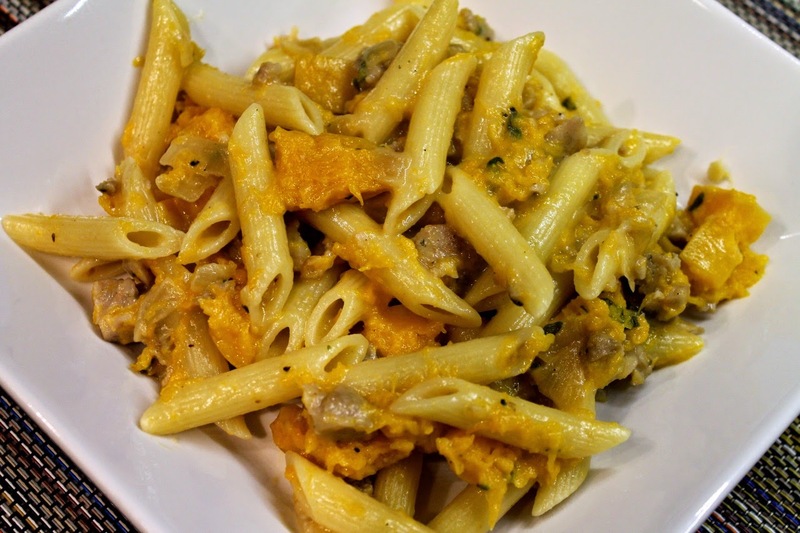 Along with the sausage, it makes a tasty, seasonal pasta dish, similar in flavor to my butternut squash, goat cheese and sausage lasagna, although far faster and easier to prepare. Because the pasta is going to be cooked twice--first in the boiling water and then stirred into the sauce--be sure to not cook it past the al dente point where it is quite chewy. In fact, you might want to stop a notch shy of al dente if you like a firmer pasta (like I generally do). 1. Heat a large pot of salted water over high heat until boiling. Add pasta and cook according to package directions for al dente (cooked through but still chewy). Reserve 1 cup of pasta cooking water. Drain pasta and set aside. 2. Heat a large sauté pan over medium heat. Remove sausage from casings and add to pan. Cook, breaking up with a spoon, until cooked through and lightly browned. Remove sausage from pan and transfer to a cutting board. Chop until finely minced. 3. Increase the heat under the sauté pan to medium-high. Add the olive oil, butter and onion. Cook until the onion softens, then add the butternut squash and garlic. Cook, stirring occasionally, until the onions and squash are soft and lightly browned in places, about 12-15 minutes. Stir in the sage and nutmeg, then add the cooked pasta and sausage. Cook, about 1-2 minutes until fragrant and the sausage in reheated. Remove from the heat. Add the reserved pasta cooking water and chunks of goat cheese and stir to combine (the residual heat will melt the cheese). Serve in shallow bowls with topped grated parmesan.